You know those evenings where you don’t feel like making dinner or you have NO IDEA what to make? Those nights where you kinda wish you could just skip over dinner time and go straight to bed time? 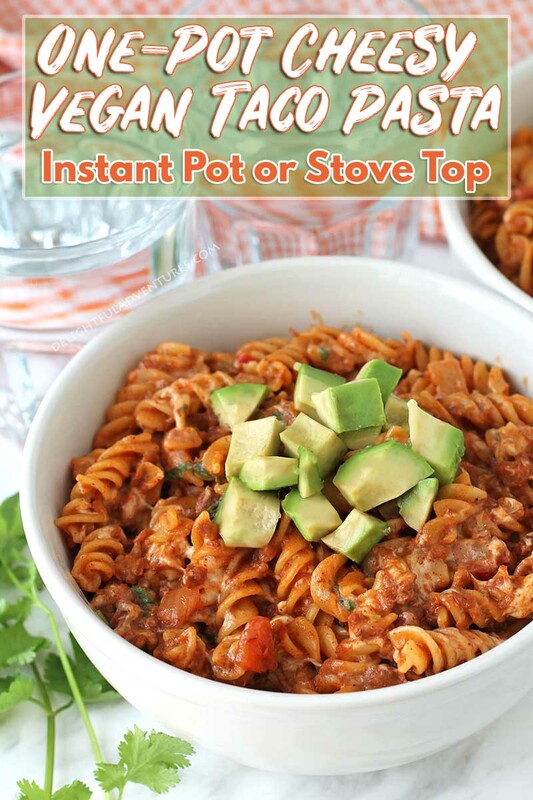 THIS easy, tasty, vegan, one-pot cheesy taco pasta is the dinner you make on THOSE nights! This page contains affiliate links. Click to learn more. 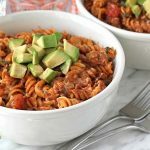 Just like my Taco Rice Bowls and my Vegan Garlic Pasta, you can have this one-pot cheesy taco pasta on the table in under 30-minutes. It’s loaded with flavour, needs just a handful of simple ingredients, and can be made in your Instant Pot or on your stovetop, directions for both methods are included! It really can’t get any better than that! This is a recipe I first discovered in my Pinterest feed on one of those nights. I typically plan out what I’m going to make for the week, in advance, but this week in particular, things fell by the wayside and I was winging it as the week was coming to an end. The recipe I adapted to make this recipe is a very non-vegan recipe, but as you know from some of my other recipes, “veganizing” non vegan recipes is something I love to do. I also added a few extra ingredients to suit my tastes and I think what I’ve come up with is quite delicious. Not to mention, the kids love it, and if you’re a parent, you know that kid approval at dinner time is golden! 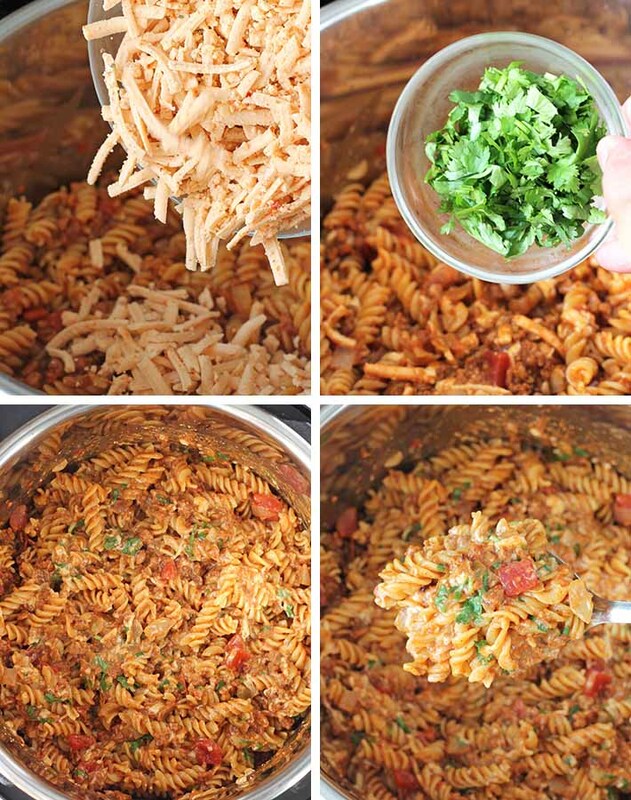 How Do You Make One-Pot Cheesy Taco Pasta? The first step is to sauté the onions for a few minutes. 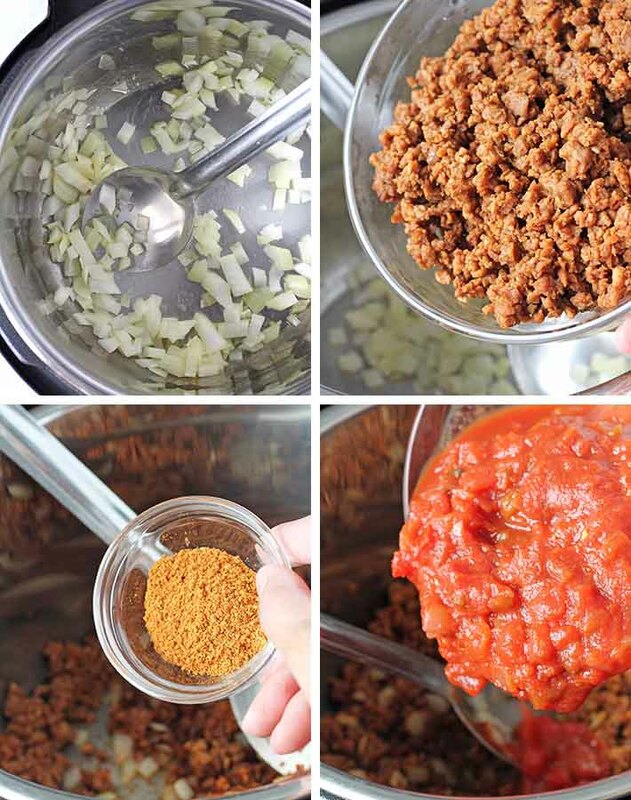 You’ll then add your vegan meat crumbles (you can use any brand you like, just be sure that if you are gluten-free, that the brand you buy is actually gluten-free). Next, the taco seasoning and salsa gets added to the pot. You’ll then add the rotini pasta and the broth. If you’re using an Instant Pot, set the time to pressure cook based on your noodles (see more about this below). If you’re cooking on the stove, bring to a boil, cover, and then simmer until the pasta is cooked through. Give it all a quick stir, add some toppings if you’d like (see below for some ideas! 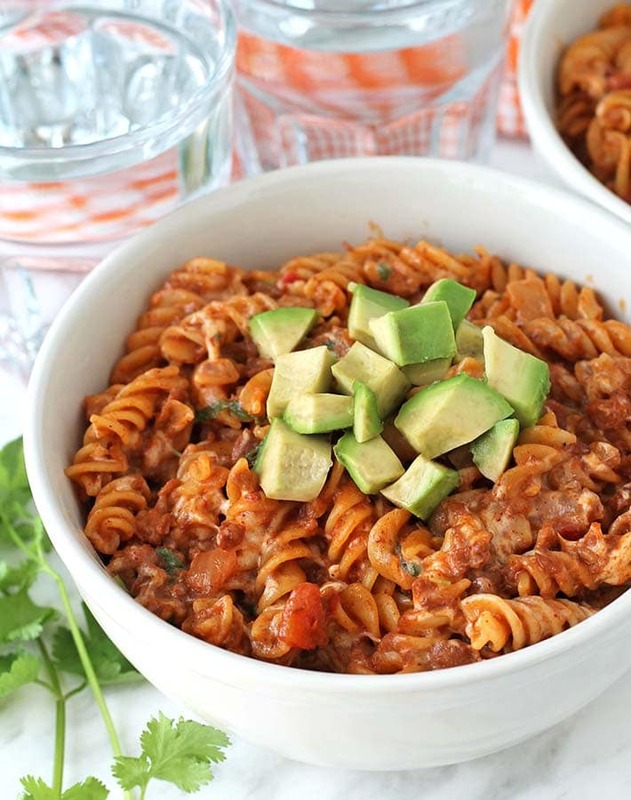 ), and your quick and easy taco pasta dinner is ready to serve! How Long Does it Take to Cook Pasta In a Pressure Cooker? The answer to this question depends on the type of pasta you’re cooking. My family has had to endure quite a few mushy pasta meals while I figured this out! It’s easy to fix under cooked pasta but once it is overcooked, there’s no fixing that. I’ve found that the best timing, for the brand of pasta I use, is to divide the boil time by 2 and minus 1. So if a pasta calls for 8 minutes of boiling time, the pressure cooking time would be 3 minutes. You know how some gluten-free pastas stick together unless you’re constantly stirring the pot, or it creates a thick, pasty water as it cooks? This brand does not do that. (These things usually happen with brown rice based pastas.) I would not recommend a brown rice pasta for one-pot pasta recipes. 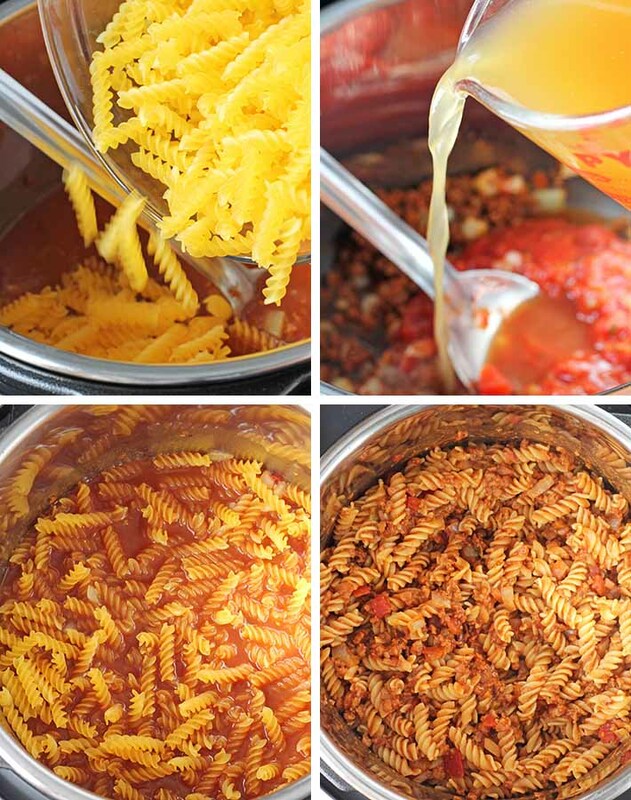 I have only made this recipe using Barilla’s rotini noodles, the noodles you see in the pictures, so I can only speak for that type of pasta. If you’re using a different brand of gluten-free pasta, you may need to do a little experimentation to find the perfect time for that particular one, but using the guidelines above will help. If you do end up trying another brand that works well for you, tell me about it in the comments! And one more note about the pasta, I would stick to pasta shapes for this recipe and not use spaghetti or any other type of thin or long pasta. They require a whole other set of rules when pressure cooking that I haven’t taken the time to figure out yet. 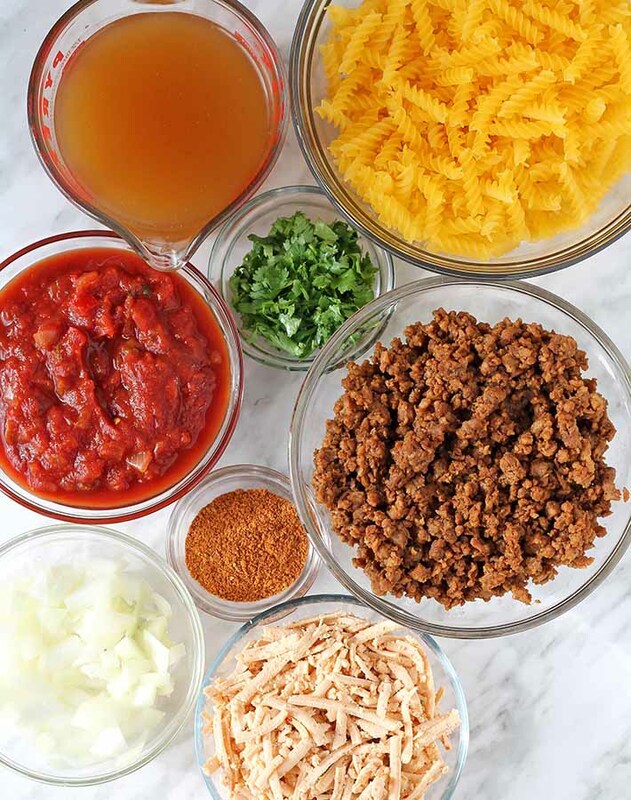 Basically, anything you’d put in or on a taco would go great with your easy cheesy taco pasta. 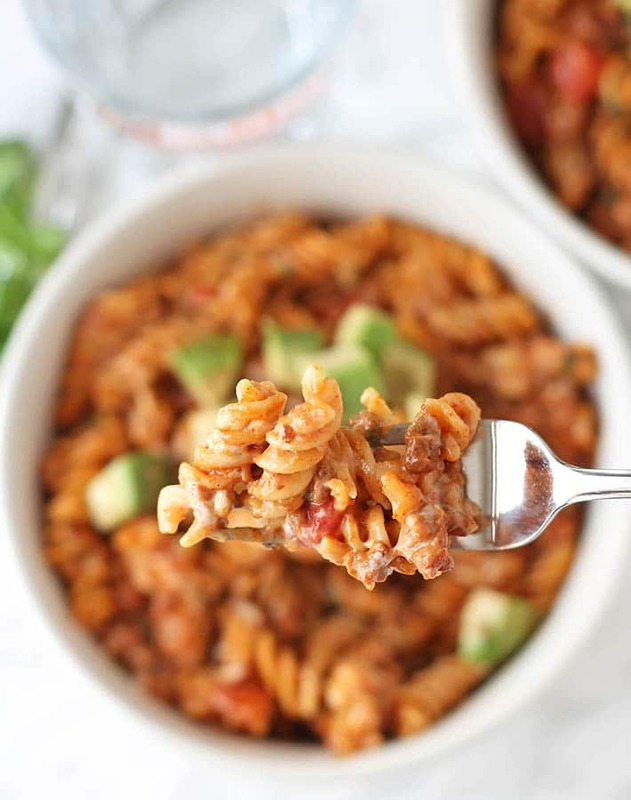 So…the next time you’re dealing with the what to make for dinner conundrum, whip up this cheesy taco pasta in your Instant Pot or on the stove. After you taste it, you, and everyone else, won’t believe that it took under 30-minutes to make! 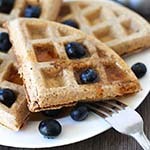 If you like this easy vegan dinner recipe, you’ll probably also like these! 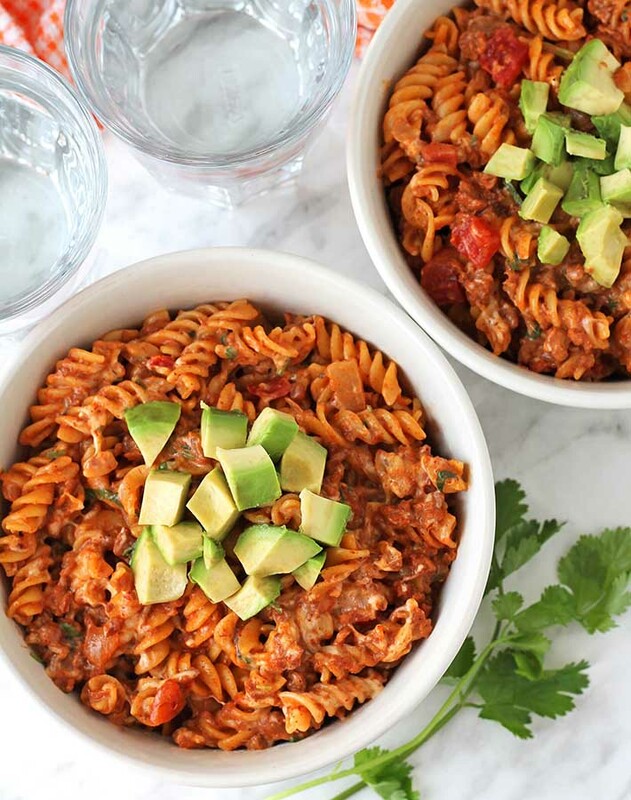 You can have this easy, tasty vegan one-pot cheesy taco pasta on the table in under 30-minutes! It's loaded with flavour, needs just a handful of simple ingredients, and can be made in your Instant Pot or on the stovetop. Set your Instant Pot to sauté and add oil. Once heated, add the onions and sauté until softened, about 3-4 minutes. Add the vegan meat crumbles and sauté for another minute. Add taco seasoning and stir to coat the onions and crumbles. Add salsa and stir again. Add rotini pasta and broth and stir to combine everything, be sure scrape up any bits that have stuck to the bottom of the pot. Place and lock lid onto the pot and close the pressure release valve. Set to pressure cook for 3 minutes (timing will vary based on type of noodles you are using, see info above). Pot will take roughly 10 minutes to come to pressure. When the pressure cooking time has ended, press cancel and carefully open the pressure release valve to manually release the pressure. Once pressure has been released and the float valve pin has dropped, slowly unlock and remove the lid. Add vegan cheese shreds and stir to combine. Add cilantro or parsley and stir again. Serve immediately. Over medium high heat and add oil to a large pot. Once heated, add the onions and sauté until softened, about 3-4 minutes. Add salsa and stir again. Add rotini and broth and stir to combine everything, be sure scrape up any bits that have stuck to the bottom of the pot. Bring mixture to a boil, stir, lower temperature, cover, and simmer. When pasta has absorbed the liquid and is cooked through, remove the pot from the heat. IMPORTANT: If making in your Instant Pot / pressure cooker, please read all of the info above about how to figure out the proper cooking time, based on the type of pasta you're using. 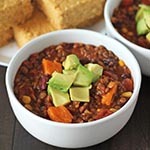 This recipe makes 4-5 servings (depending on how large you make each serving). Use your favourite prepared, jarred salsa. Use your favourite vegan cheese shreds. I like to use pepperjack flavoured shreds for the extra spice. If you're not gluten-free, one 340g package of Yves veggie ground round will work. 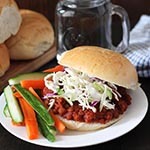 You can also use the Mexican flavour and omit the taco seasoning. Cooking time above is based on the stove top method. Cooking time for the pressure cooker method is 10 minutes prep + 3 minutes cook time + 10 minutes to come up to pressure (23 minutes total). Nutrition info is for 1 serving (of 4) prepared as the recipe is written and without any toppings. I used cilantro, low sodium broth, low sodium salsa and gluten-free rotini. Data below is only to be used as a rough guide. Click to learn how nutrition info is determined on this website. Recipe adapted from Simply Happy Foodie. Never Miss a Recipe!Get the newest, easiest, most tastiest vegan recipes in your inbox for FREE! Click here to sign up for my newsletter. All images and content on this website are copyright protected. Do not republish any recipes or text. Click for copyright & image sharing info. Delightful Adventures is a participant in the Amazon Services LLC Associates Program, an affiliate advertising program designed to provide a means for sites to earn advertising fees by advertising and links to Amazon.com, Amazon.ca, and Amazon.co.uk. As part of this Amazon Associates program, the Website will post customized links, provided by Amazon, to track the referrals to their website. This program utilizes cookies to track visits for the purposes of assigning commission on these sales. As an Amazon Associate I earn from qualifying purchases. Amazon and the Amazon logo are trademarks of Amazon.com, Inc. or its affiliates. As an Amazon Associate I earn from qualifying purchases. Click to learn more.